Wicker furniture is not only meant for outdoor use, it can also be used as indoor furniture. To ensure that you buy the right wicker furniture for your space, here are 3 tips. Buy wicker in lighter colors – Unlike wicker for the outdoors, wicker furniture for indoor use come in lighter shades. Since the wicker is not affected by the elements, your furniture is less likely to get damaged. Think light colours such as white, beige and mustard. These colours will bring a sense of freshness to your space and since they are neutral, you can mix and match your furnishing. Buy wicker without resin or vinyl finishes – Since your furniture will mainly stay indoors, you can opt for indoor wicker furniture without the added finishes. This means that your furniture will look more natural and not have nasty chemicals. Less finishes also means that your furniture will cost less. Consider your theme and space – Your furniture should compliment your space. If you are more modern, choose styles that are more boxy and angular. To add to the look, choose side tables and coffee tables with square edges. For those who prefer a cosy, simple feel, opt for furniture with rounded edges with arm rests. You could include a rocking chair and loveseats to create a cottage feel. If you’re considering using your furniture in your patio for occasions, buy a range patio furniture cushions in a fun colour, pattern or fabric. 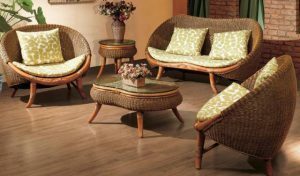 Find your next wicker furniture sets at Wicker Paradise, providers of the finest quality wicker furniture.